You can count on Utah County to find the appropriate gesture to commemorate the passing of a public figure. 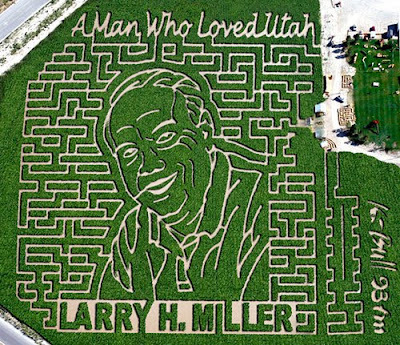 Behold, plans for the Larry H. Miller Memorial Corn Maze!!! Love it that K-Bull 93 sponsored it and carved their call sign into the corn. Country radio, a Larry Miller agro memorial and a 2-0 BYU football team. . . could the party get any hotter in Provo right now? Throw in a date at Thanksgiving point with a braided belt and you just guaranteed yourself a night of non-stop, unpassionate kissing. Golden Griff knows all about unpassionate kissing . . . with one E*M*LY W*RD.